The award-winning Back to Nature Chloe Caterpillar number rug is ideal for cross-curricular use in schools, pre-schools and nurseries. The brightly coloured classroom carpet features a giant alphabet caterpillar around the outside with numbered ladybirds in the centre. 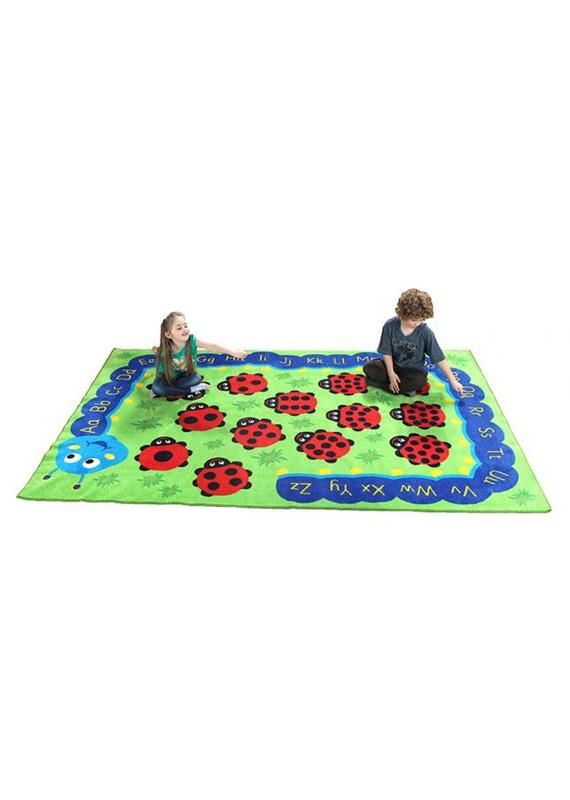 The Chloe Caterpillar rug supports Key Stage 1 Numeracy and Literacy Skills. Ideal for classroom reading corners, play areas or everyday classroom use. The distinctive design not only brightens up any classroom, but encourages learning in a fun and interactive way. The anti-stain alphabet mat can be easily spot cleaned with a damp cloth, and the anti-crease feature means you can roll up the mat and store it when not in use. Manufactured using a premium quality carpet with an extra thick, soft textured Nylon tufted twist pile which is designed for longevity and durability. The tightly bound edges prevent fraying and the tuft strands meet heavy duty laboratory pull tests. This classroom rug features a specially designed anti-slip Rhombus backing to ensure safe use on all surfaces, and meets essential safety standards EN71 Parts 1, 2 and 3.